In the office, there is nothing like a sturdy computer desk. An office desk defines a designated area for office workers and it’s one of the most important furniture pieces in the office. An office desk should fit accurately with each employee’s height and office chair. Make sure the desk gives plenty of room for a computer to be placed as well as extra space for work documents and supplies. The Computer is used for an entire workday. Unlike an ordinary office desk, a computer desk is made for office ergonomic usage of a computer. A Computer desk can include a sliding keyboard to give plenty of room to a worker. This increased comfort will make your employee work faster and ahead of deadlines. The reason computer desks are a must in the office compared to ordinary office desks is based on being adjustable furniture. No longer will your employees have to adjust to work stations. 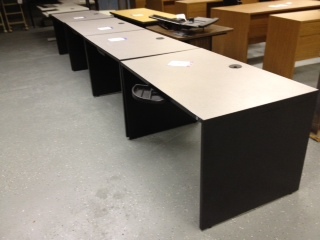 Now, the workstations can adjust to them and keep them comfortable throughout those long workdays. Computer desks can keep workers healthy. The health of your workers is very important because their health relates to your company’s overall productivity. Computer desks are categorized as ergonomic desk for their ease and functionality. Office Supplies are easily accessible. A computer desk can store all your office supplies in its pull-able drawers. This entry was posted on Friday, August 24th, 2012 at 4:29 pm. Both comments and pings are currently closed.